Business execs and sales people are paid to make decisions and sell, not to spend their days buried in data analysis. Business executives need to make decisions. That’s what they do – lots of decisions about lots of things every day. Sales people need to make sales. The more sales they make, the happier the business executives and the higher their commission. What business execs and sales people don’t want to do is clean messy data, do hours of discovery, or build reports. They are paid to make decisions and sell, not to spend their days buried in data analysis. Decision-makers love data. But, they want it to be relevant to them and ready-to-use. Sometimes in the BI [Business Intelligence] industry, we get so caught-up with our love for data, that it’s easy to forget that most people love data discovery as much as they love visiting the dentist. This is where analytical apps come in. What is an analytical app? An analytical app is a ready-to-use app allowing business people to engage with relevant analytics for their business. You can think of it as a dashboard, you can think of it as a storyboard, but, essentially, it’s a contained and pre-built experience for the business user. That app might be built internally by a data analyst, or it might be delivered off the shelf by a third-party. 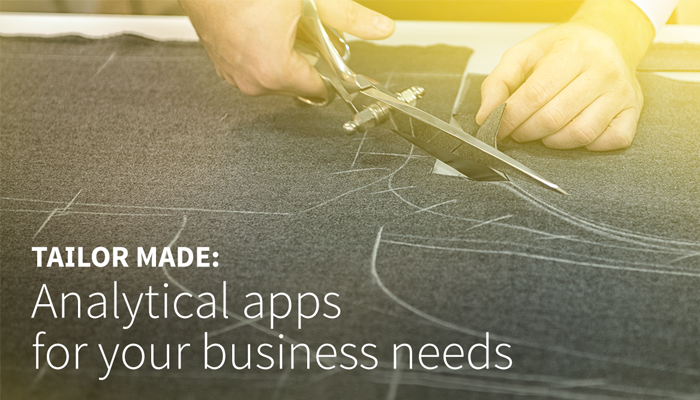 Wherever it’s created, it comes to the business user as a pre-built, curated analytics platform. For a really simple example, think of your online banking. Log in and the metrics show you where you’ve spent your money, how you’ve spent your money, and how much money you have left to spend. The interface could display thousands of things the bank has data on – the current share price, number of customers from different postcodes, breakdown of staff by gender – but they know which information you are most likely to find useful and have provided only that. It’s been purposely designed to help you have a curated and relevant data experience in that environment. Once you get the idea of an analytical app being a pre-built and contained experience for the user, it can be applied to anything. A hiring manager may have an analytical app that shows interactions with a recruitment firm, for example. At his or her fingertips are insights regarding how many people the firm has recruited in the last 12 months, where they’ve been recruited to, and the retention rate in each business unit. The end user benefits from those insights through a very deliberate user experience. The experience is tailor-made for that user and the job they’re trying to do. That means that someone who understands the business intimately has built it for them. Traditionally, the approach in this space has been to deliver as much data as possible and hope it will be useful. Rather than delivering 1,000 reports and 20 different dashboards, the better approach is to deliver one or two dashboards that are highly targeted and that really help the business user to get value from the data that they have available. The big shift in moving from delivering BI to delivering analytical applications is the team required. Instead of delivering data, it’s now about delivering an experience. Doing that successfully requires a user experience skill set. Now, that’s not to say there’s no place for IT – this is still a data-driven space, and so it needs a data expert to deliver the final product. But, it also needs someone who fundamentally understands the business, as well as how data can be used to help reach the goals of the business. Put simply, building an analytical application requires a product manager – someone to talk the language of the ‘customer’ and advocate on their behalf. Every organization has the combination of the necessary skill sets; it’s just a matter of bringing them together into an agile team that has a purpose of delivering an analytics product to be used by the business. Analytical applications are a response to the past 40 years of Business Intelligence. On one hand, we know that IT-driven BI doesn’t work for business users. And on the other hand, we also know that self-service BI doesn’t work for business users. Analytical applications are a new middle ground. Analytical applications are a middle ground that focuses on delivering a ready-to-use and curated analytics experience specifically for the business user. Analytical applications need to be widely deployable, they need to be able to be governed at a high level, and they need to be customizable. In an ideal world, they will be white-labeled so that the ultimate purchaser can put their own logo on it and create an environment that makes the end user feels like it was only built for them. These are all things that we’re focused on at Yellowfin. Analytical applications are the future of our industry. You’ll hear plenty more from me on this topic over the next few months – including some exciting product releases.